The Bowker Group is an international transport company with a long and distinguished history. Tracing its roots back to 1919, it was there when the road transport industry first began. The first overnight shipper of fruit between Liverpool Docks and Covenant Garden, and one of the first to operate between the UK, Holland and Belgium. 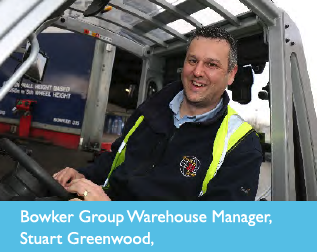 Today it operates over 150 vehicles and has over 40,000m’ of warehousing. 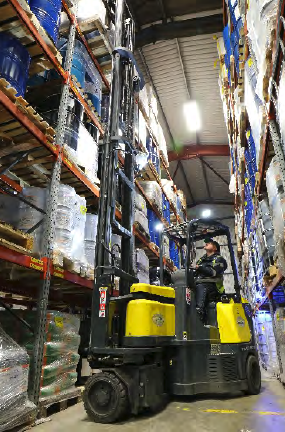 Providing a comprehensive range of dedicated and shaped-user warehousing services, the business is based in Preston, Blackburn and Hull. Bowker operate one of the region’s largest and most modern fleets comprising of 44t tractors, 26t and 18t rigid vehicles which are equipped with 1500kg rated tail lifts, reversing cameras and proximity sensors. 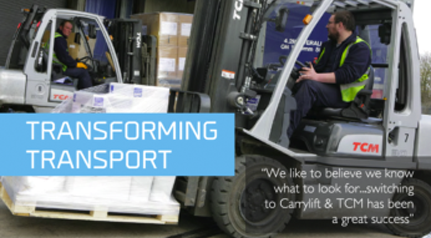 The relationship with Carrylift began in 2005 when articulating forklift trucks were first brought in. The trucks’ ability to articulate, allows them to operate in a smaller aisle width, which in turn leads to greater storage density. It’s a move that proved transformational (“We’ve never been without them,” adds Stuart), as the racking set up was changed to take advantage of the trucks’ capabilities and make the most of the available space. 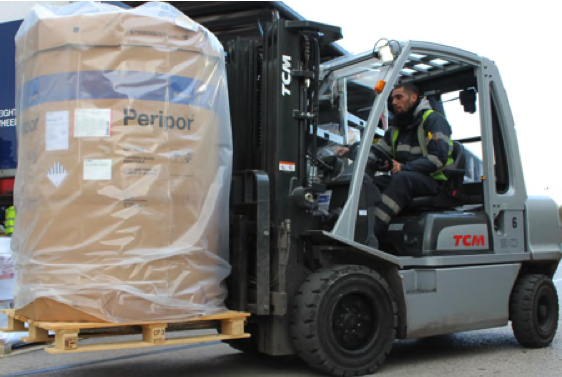 From then on, the opportunity for Carrylift to impress with their service back up and attention to detail paved the way for a new conversation on the rest of the forklift fleet. “We are not the sort of company to mix and match suppliers,” adds Stuart. “All our lorries are Volvos, and we have to justify to our management team and ourselves if we want to make significant changes like this.” Perhaps that long history engenders a more cautious approach, but it certainly doesn’t prompt sentimentality. When the time arrived to replace the now ageing counterbalance fleet, the gauges on their onsite fuel bunkers allowed a real world diesel consumption test to be carried out. The TCM used around three quarters (actually 77%) of the fuel the other used, enough to sway the purchase decision and save anywhere between £9 to £16 (depending on the fluctuating diesel costs) in fuel per shift on a four truck application. “We operate in a large concrete yard, there’s a lot of travelling and an on-site rail terminal. Going over the rail lines takes its toll on the trucks. 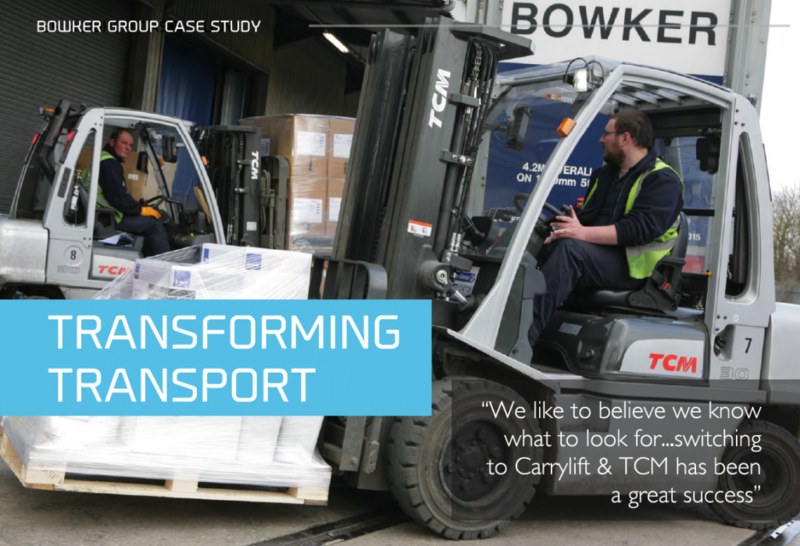 Our experience is there are some trucks that just aren’t cut out for this type of application, but the TCMs stand up well and we feel more than satisfied with having implemented the changes.” It helped that the TCM brand was not completely unfamiliar to Bowkers, having had one in the group from 1988 that’s still operational today. The focus on durability was also key, for as well as fuel consumption, reliability is also vital. For customer business, it’s essential to keep moving, but much of the work is also ‘container stuffing’ as part of the company’s own transport operation. This means that later in the day when most of the fleet comes back, a four hour window is allowed for overnight pallet exchange work (Bowker is a member of both Pall-Ex and Hazchem networks). Up to a dozen trailers each night exit Preston alone, which provides another time constraint earlier in the day as orders need to be picked and ready to be out the door by 5pm.